This multi-level case insert features a closed cell, crosslinked foam construction with fused walls that provide excellent memory so that the insert keeps its shape through repeated usage while safeguarding goods of varying weights. 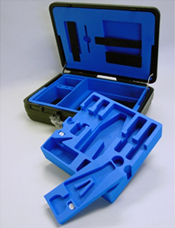 This custom designed medical case was engineered to accommodate endoscopic instruments of varying sizes. The case features a durable, scratch-resistant ABS plastic housing that protects instruments from damage when stored, enabling them to be transported safely and serving as an aesthetically pleasing method to display high quality medical devices. Whether you need to protect valuable medical equipment for shipping and storage or require a more secure way for salespeople to transport samples and demonstration units, UFP Technologies can create the perfect medical case for your application. Choosing the right foam is crucial for many medical applications because of safety regulations and crosslinked foam is one of the most commonly used. It can be used to protect class “A” surfaces and can feature antibacterial properties. It is also ideal for applications where purity and outgassing are issues as crosslinked foam expanded with nitrogen is both chemical and resistant. With its interior foam insert, each individual case can be used to securely store different sizes of endoscopic instruments to improve organization and accessibility. Because all multiple components can be stored in a single case, item identification and retrieval is enhanced. Fabricated from closed-cell crosslinked polyethylene foam, the inserts are durable and can be easily cleaned. They are CNC-machined so they can be easily revised without tooling, providing a cost effective solution for low to medium volume applications. They feature one-piece construction for durability, multiple cavity depths to provide a custom fit for each item, and come in a variety of colors to enhance product appearance and accessibility.